October 29, 2014 Culture » Big Shiny Robot! After the release of 2011's abysmal failure of a film Green Lantern, it's been said that the unofficial motto around the offices of DC Entertainment is, "No jokes." Whether that was actually said, it's hard not to assume that the sentiment was taken to heart, if only subconsciously. Both DC Comics-based movies released since that time have been a humorless morass, each one "grittier" than the last. And since we've only been given The Dark Knight Rises and Man of Steel during that time, how—and why—in the world do you make a Superman film grittier than Batman? On the television front, we've seen The CW's popular Arrow and Fox's Gotham. You might find a few chuckles here and there, but otherwise, those two are chock-full of grit. NBC just debuted Constantine, based on a DC Comics character, and from the commercials, it looks equally grim—doubly so when you consider the occult-based source material. 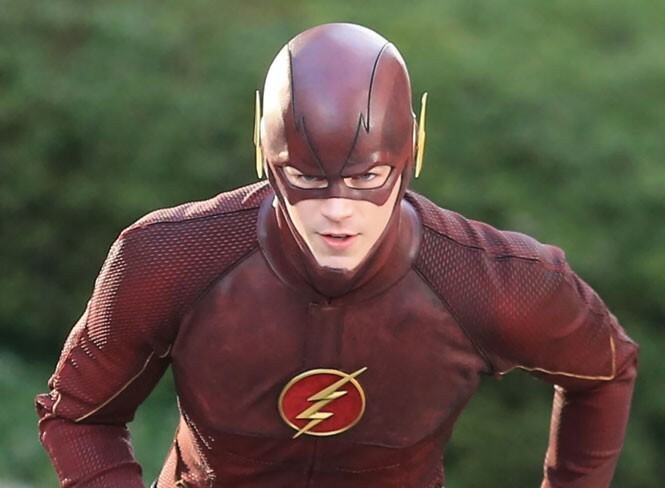 But DC has finally given us the tiniest breath of fresh air: The CW's The Flash. That show revolves around a reconfigured version of the hero from Central City, the Scarlet Speedster himself. Here, The Flash's alter ego, Barry Allen, is played much more like a Peter Parker-type character: a down-on-his luck nerd with a dead loved one in his past who motivates his future. In fact, the pilot episode of The Flash is better, more fun and more lighthearted than Marvel's grit-filled The Amazing Spider-Man 2. It's engaging and actually funny, and I'm glad its showrunners missed the "no jokes" memo. The angst isn't front and center, and the grit isn't getting in anyone's eyes. Grant Gustin, who plays Barry Allen/The Flash, has an honest, earnest quality that makes him a natural when it comes to having fun yet feeling the pain and anguish when necessary. But the future of DC Comics makes it seem as though this is the exception rather than the rule. DC Entertainment released its slate of planned films that will be coming out over the next six years, and there is nothing in there that screams "Fun!" The next film we're getting is titled Batman v. Superman: Dawn of Justice. Perhaps it's an extended episode of The People's Court with Batman and Superman suing each other in small-claims court. Or maybe it's our two favorite DC heroes in a massive, gritty misunderstanding, battling each other for the incredible nerd-pandering grittiness of it all. And although I'd love to see the former, we all know it's going to be the latter brand of slugfest. Can the blame be laid at the feet of Green Lantern? Maybe, but the executives in charge at Warner Brothers are the bigger culprits. They seem to learn the wrong lessons on a consistent basis. The film didn't fail because people didn't want to see jokes in a superhero film—otherwise, no one would see any of the Marvel movies. The film failed because the jokes (and the whole script, for that matter) were terrible. Christopher Nolan's Batman movies didn't succeed because of their grittiness; they succeeded because they were Batman films that were written and produced more seriously than Joel Schumacher's Batman films. I'm still trying to figure out why the hell Man of Steel made money. Whatever the reason, let's hope DC learns the right lessons from The Flash for a change. Then, maybe going to see DC superhero movies will be fun again. In the meantime, I'll have my bored yawns at the ready.